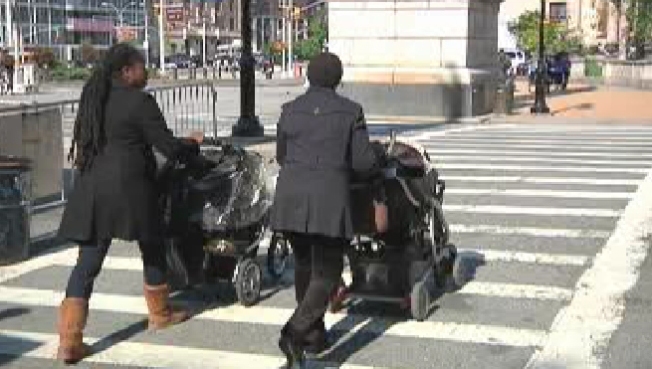 A 2009 survey of Park Slope parents discovered what nannies are really getting paid and how the economy has impacted the parent/nanny relationship. Any new parent will tell you that hiring a nanny is one of the most stressful parts of raising a child. Aside from the worry over letting a stranger care for your most prized possession, there is also the uncertainty of hiring a personal household employee for the first time in your life. Dr. Susan Fox at the group Park Slope Parents discovered that parents were constantly asking other parents for advice on things like how much should a nanny make? We spoke with parents in Prospect Park who had posed similar questions when they began their nanny searches. "In terms of a part time situation, full time ...in terms of benefits, we ended up giving (our nanny) a cell phone because she didn't have one. Should you give her a metro card? These were our questions." Said parent Faye Rimalovski. "They're looking after your child so you really don't wanna scrimp on paying somebody an inadequate salary for something that really has a lot of responsibility." Said Park Slope parent Mike Jonas. How Much Should You Pay Your Nanny? The search to find and keep a good nanny drives many parents to great lengths. So, what's the pay rate for nannies? So Fox created the nanny survey. She polled over a thousand local parents to see how they compensate the nanny. Fox just released results from the second instalment on their website parkslopeparnts.com. The 2009 survey found that full time nannies paid per week are earning anywhere from $12.00 to $15.00 per hour for one child. Part time nannies paid by the hour are making between $13.50 to $15.00 per hour for one child. Then when the second child is born the rate usually goes up by $1.00 to $2.00. "You want to pay them enough so that they're happy, but at the same time you can't pay them so much that if you're doing free lance work you're losing money having someone take care of your kids." Said Fox. The survey also found that the economy hit working parents hard in the last year. 39 percent of parents had to cut back hours, get a nanny share, or let their nanny go. Even so, 91 percent gave a holiday bonus. One of the most controversial questions asked was do you pay your nanny on the books? 70 percent said they do not pay on the books. But Fox says the reasons usually quite innocent. Most nannies ask to be paid off the books. The survey also found that parents who do pay on the books were more likely to get in trouble with the IRS for filling the paper work out incorrectly. Parents who paid under the table were very unlikely to have a problem with the IRS. Still, parents who do pay under the table should be aware of a new law that guarantees all nannies unemployment benefits. That means if the nanny opts to collect after being let go, a parent who paid off the books then becomes responsible for the back taxes. But parents who do pay under the table should be aware of a new law that guarantees all nannies unemployment insurance. which means if the nanny collects after being let go, a parent who paid off the books then becomes responsible for the back taxes.